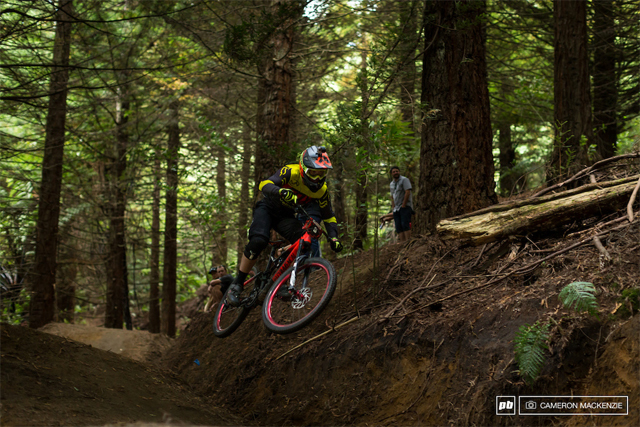 This year saw the debut of the newest Crankworx Rotorua event for, the Crankworx Rotorua Air DH, giving the pros a chance to race with the Rotorua riding community on Skyline Gravity Park’s jump-laden answer to the Whistler Bike Park’s Aline trail, Mr. Black. Designed to mirror the Crankworx Whistler Fox Air DH, the race was a 32-jump rip down the mountain and the winner, rocked up, signed up and dialed it in. “They’ve used the hill really well. It’s quite a flat hill, but it still carries speed everywhere, so they’ve done a really good job,” said George Brannigan, noting he hopes more pros sign on in years to come and the event builds. Female winner Rae Morrison, a top-10 Enduro World Series rider, said she loved it. “That was my final event, so it was all about having fun, and after this I can be social and spectate,” she said. Points are stacking up as the Crankworx season kicks off its four series events and the race for King and Queen of Crankworx. New Zealand’s very own Matt Walker is coming on strong, leading the race for King with 225 points, while Casey Brown and Beerten are tied for queen with 250 points each.